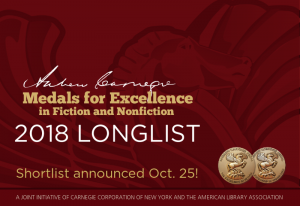 46 books (25 fiction, 21 nonfiction) have been selected for the longlist for the 2018 Andrew Carnegie Medals for Excellence in Fiction and Nonfiction. The list is now available on the awards’ website. The six-title shortlist—three each for the fiction and nonfiction medals—will be chosen from these 46 titles and announced on October 25, 2017. The two medal winners will be announced by 2018 selection committee chair Victoria Caplinger at the Reference and User Services Association’s Book and Media Awards (BMAs) event at ALA Midwinter Meeting in Denver, Colorado, on Sunday, February 11, 5:00-7:00pm.